Indonesia - As scientists are increasingly exploring the high carbon stocks contained in mangroves, tidal marshes and seagrass meadows – known as ‘blue carbon’ – alarm bells sounding for these ecosystems’ rapid destruction have never been louder. “Indonesia has the highest mangrove cover on earth, but Indonesia is experiencing the highest mangrove deforestation rate in the world. This is very sad,” said Virni Budi Arifanti, researcher at Indonesia’s Forestry and Environment Research, Development and Innovation Agency (FOERDIA) and panelist in the “Mangroves and Blue Carbon” discussion forum at the 2018 Asia-Pacific Rainforest Summit in Yogyakarta, Indonesia. Mangroves, she explained, contain the second highest carbon stocks after peatlands, storing three to four times as much carbon as tropical forests. FOERDIA’s findings match those of a 2015 study carried out by the Center for International Forestry Research (CIFOR) that calculated Indonesia’s mangroves as storing 3.14 billion tons of carbon – a third of the carbon stored in coastal ecosystems worldwide. “The uniqueness of the mangrove is its additional input from autochthonous carbon, or carbon from marine inundation,” said CIFOR researcher Sigit Deni Sasmito, noting the extra carbon added in marine environments from the breakdown of algae and other organisms. It’s not just carbon emissions that these ecosystems can put at risk. 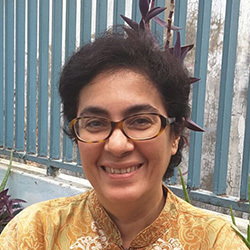 During the 2004 Indian Ocean tsunami, “many lives were lost because mangrove forests had been cleared in some coastal areas of Myanmar,” said Nang Mya Han, professor at Myeik University in Myanmar, which contains 500,000 hectares of mangroves – the fourth-largest area in Southeast Asia. Now, areas like the country’s western Rakhine coast are in a vicious cycle, where annual tropical storms and cyclones cause increasing destruction to these natural barriers. In 2008, the Nargis cyclone saw death tolls rise above 130,000 in the Ayeyarwaddy, Yangon and Mon regions. Speakers on the panel “Mangroves and blue carbon” at the 2018 Asia-Pacific Rainforest Summit. For local communities, mangroves are often a main source of income through ecotourism and non-timber forest products. Because of their opportunities for economic benefits, mangroves require careful attention from the private sector. “To manage a mangrove forest sustainably, you have to understand the type of land,” said Fairus Mulia, Managing Director of Indonesian wood chip, pulp and paper company PT Kandelia Alam. A decade ago, the company acquired an 18,000-hectare concession of swamp forest in Indonesia’s West Kalimantan. Using silviculture systems, they divided 12,000 hectares into 20 annual cutting blocks, reserving the remaining 6,000 hectares as conservation areas, including 600 hectares cut each year for enrichment planning. “Now, we not only produce wood chips, but also ecotourism. You can find Irawaddy dolphins and proboscis monkeys in the concession,” said Mulia. At a national level, reforestation efforts are underway in Indonesia and other countries. Barbara Masike, Papua New Guinea Country Director for The Nature Conservancy, agreed that stronger policies and legislation – including traditional leadership – needs to be put in place to keep coastal ecosystems healthy. “Learning from some of the work we’ve done with the communities in PNG, we need to strengthen traditional governance and tribal leadership, so they can continue to pass on that knowledge to the younger generations,” she said. While ad hoc projects targeting these ecosystems are happening around the world, panelists said they should be pulled together under internationally shared, holistic strategies to protect and benefit from blue carbon landscapes. Masike called for more countries to join efforts like the International Partnership for Blue Carbon and to include mangroves in more REDD+ efforts. Once under mandates from the initiative, governments can then reach out to involve more stakeholders. Ketut Sarjana Putra, Vice President of Conservation International Indonesia, agreed that governments should appreciate coastal ecosystems as natural assets that provide environmental services. “Only by doing that do I strongly believe that sustainable management of coastal ecosystems and small island nations can be fully protected,” he said.